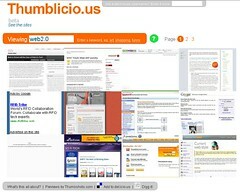 Thumblicious is a new way to browse the internet, by displaying screenshots of the most popular sites from del.icio.us. Del.icio.us is a service that stores bookmarks (favourites) online. When a lot of people all bookmark the same page – it’s probably worth having a look at – so del.icio.us flags it as ‘popular’. Bookmarks at del.icio.us can also be ‘tagged’ with descriptive keywords. You can use thumblicio.us to view bookmarks tagged by any of these keywords. Thumblicious is a site by Joe Lanman (contemplate.org.uk) and Alex Macmillan (beefour.com) – email us at info – at – thumblicio.us. Screenshots come from the lovely people at thumbshots.com.